Club Penguin Cheats by Mimo777 Club Penguin Cheats by Mimo777: Club Penguin Puffle Launch... Launched on Android! I have a Cruz Tablet equipped with Android 2.0, does that count? I bought this app just now. Excited to play it on my phone. I sold my iTouch since I didnt need it because I get everything on my phone. So I am happy that they launched this. @Josen: all android devices are capable of downloading this app. Yay! 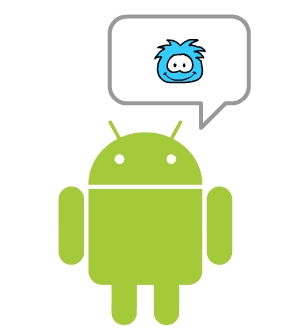 The Android can speak puffle language! Omg, i have HTC Wildfire with Android. How Its possible to buy this? I dont get it. Will they lunch Symbian version? I was reading an old post, and it mentioned Puffle Handler. Can someone tell me what this is? Puffle Handler, (Or PH), is a elite puffle tamer/ trainer. She trains and handles puffles, to become secret agents. She is most commonly seen in the Club Penguin DS games. I hope I helped!! I have a driod 3. I doubt ill get it though. But it does looks beast! I did get it on my ipod and iPad 2!!! It's pretty fun! Thank you! I was thinking it was like a game or an update. Idk why becuase I've played the DS games. how can everyones least favorite game be in apps like what?